A funeral Mass for Franciscan Sister Annunciata Bleil was offered Jan. 8, at the St. Francis of Assisi Convent Chapel in Saint Francis, Wis. 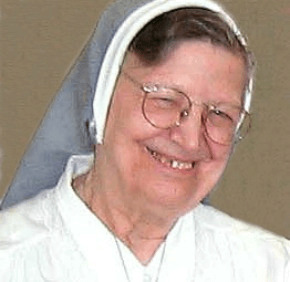 Sister Annunciata died Dec. 23. She was 90. Born Mary Bleil in Pittsburgh, Sister Annunciata received her religious name when she entered the Franciscan Sisters of Baltimore in 1948. She professed her first religious vows in 1950. In the Baltimore archdiocese, Sister Annunciata served as a teacher’s aide at St. Elizabeth School, a special education school in Baltimore; and St. Francis School in Baltimore, a now-closed institution that also focused on special education. From 1987 to 2003, Sister Annunciata ministered in the clothing department at the Franciscan Center in Baltimore, where she was known as the “shoe lady” for measuring the feet of clients to make sure they had proper-fitting shoes. Known for treating the poor with dignity, Sister Annunciata inspired Sulpician Father Robert Leavitt, former president-rector of St. Mary’s Seminary in Baltimore, to preach a Holy Thursday homily using her ministry as a model of Christ’s foot washing. Sister Annunciata, who earned a degree in elementary education from what is now Notre Dame of Maryland University in Baltimore, also ministered in Virginia, New York and Pennsylvania. After the Franciscan Sisters of Baltimore merged with the Wisconsin-based Sisters of St. Francis of Assisi in 2001, she moved to Milwaukee in 2003.